The Batrider (or Jin’zakk, as he was formerly known in DotA Allstars), is a ranged intelligence hero known best for his signature ability Flaming Lasso. Flaming Lasso completely disables a single target in close range, completely preventing them from acting at all. The ability also allows Batrider to drag the target as he moves, giving him the freedom to deliver the helpless hero unto his teammates for the kill. The most important aspect of Flaming Lasso, however, is the fact that it goes through spell immunity. Not even those with Black King Bars can escape Batrider’s clutches, and will find themselves pulled into the enemy’s loving arms in spite of their immunity. This means that Batrider can isolate any hero—provided that they don’t have a Linken’s Sphere to block his ultimate with. The rest of his kit gives him a very strong early game presence. Firefly is perhaps his greatest asset outside of Flaming Lasso, as it gives him free pathing while leaving a trail of fire in his wake. The blaze burns enemy units in its path, dealing a considerable amount of damage over time. Firefly allows Batrider to hide within the treelines, and makes setting Flaming Lasso up much easier. Sticky Napalm, which increases Batrider’s damage on any enemy unit that he applies it to, goes hand in hand with Firefly. Sticky Napalm stacks every time it is cast, which means that enemy heroes that stay too close to Batrider for long periods of time will eventually suffer the consequences. And finally, there is Flamebreak, which applies a knockback and more damage over time in a large area. Batrider’s kit synergizes with itself supremely, though he is balanced by having certain weaknesses and caveats. For one, Flaming Lasso’s cast range is ridiculously short, requiring him to be right on top of the target in order to snag them. This means that a Blink Dagger is absolutely mandatory, for there isn’t really a way for Batrider to close the distance otherwise. His effective range is just poor overall, forcing him to be in the thick of things—which is where the most danger is. But above all else, Batrider requires a team with good coordination, as Flaming Lasso is useless on its own. Regardless of his obvious shortcomings, though, Batrider has always been and forever will be a reliable pick thanks to his ultimate. He may not be the easiest hero to play, but he sure is damn good at what he does best. 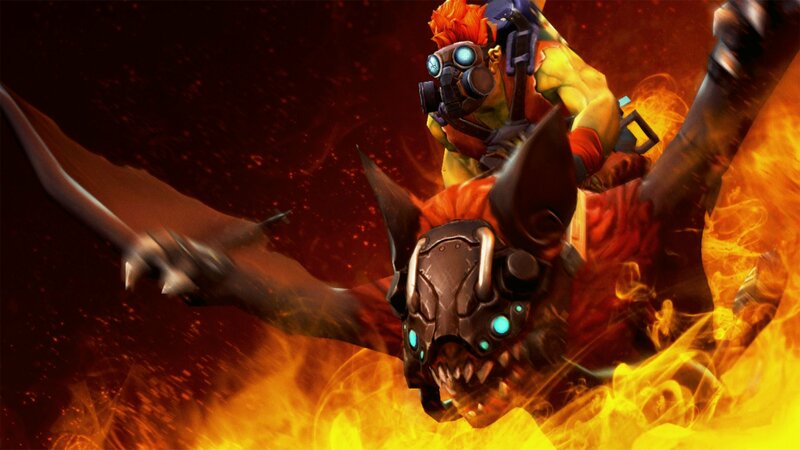 Batrider’s kit is perfect for playing in the offlane, as his abilities allow you to stay out of danger and outmaneuver those who might try to dive you under your tower. While the current metagame (7.19c in October 2018) does dictate that dual-lane setups are king, Batrider is still quite capable of holding his own without a partner. To facilitate his survival and farming in the offlane, we highly recommend getting Sticky Napalm and maxing it out first. It aids quite a lot in the war for last hits, and can even dissuade your opponents from trying anything funny. Should they throw caution to the wind and dive you anyway, you can use Sticky Napalm stacks to turn the fight around. Of course, Firefly will also come into play in the laning phase, giving you the ability to take shortcuts by going through treelines instead of taking ground-based routes. Speaking of Firefly, it will have second priority in the skill build. This is because of the great scaling of its damage over time component, which can make the difference in prolonged mid game teamfights. Flamebreak should be left at Level 1 in the early game, as it really isn’t that impactful due to its poor scaling. Of course, Flaming Lasso should be taken at Levels 6, 12, and 18 as usual. As mentioned in the opening section of this guide, Batrider needs Blink Dagger in order to get close enough to cast Flaming Lasso. There is simply no getting around this fact, but fortunately he does have tools that help him farm for it. Sticky Napalm and Firefly can clear waves and neutral creep stacks easily, without requiring that much mana. That said, going straight for Blink Dagger generally isn’t a good idea. We suggest getting cost-effective preliminary items such as Tranquil Boots and Magic Wand to help make the road to Blink Dagger easier. Once you have your Blink Dagger, Force Staff is next on the list. It’s one thing to blink in and snag a target—but you also need a way to quickly drag that target back to your teammates. Since Blink Dagger will be on cooldown after you initiate, Force Staff comes into play. Simply push yourself with Force Staff once Flaming Lasso is on, so that your teammates can have at the hapless fool that you’ve roped in. Honestly, Blink Dagger and Force Staff are the only “must have” items in Batrider’s usual arsenal. Once you have both, you’re pretty much done with farming—though of course there is room for making things even better. Black King Bar comes to mind, since you will likely be a sitting duck in the middle of several enemy heroes once you blink onto your target. You will get disabled if you have no magic immunity, which is bad because you still need to bring the target to your teammates. BKB solves this for the most part, giving you the freedom to move around after initiating. Everything else will pretty much be luxury items. Need another reliable nuke with a nice slow attached to it? Grab a Shiva’s Guard. Fancy some ranged disables that can easily turn teamfights around? Consider a Eul’s Scepter of Divinity or a Scythe of Vyse. BKB not enough? Linken’s Sphere is there to help you against immunity-piercing disables. You can even go for an Aghanim’s Scepter, which gives you two lassos. Batrider’s usual initiation combo will depend on the situation and how every hero involved in the fight is positioned, but for the most part it can be boiled down to a bread and butter rotation. First, you’ll want to use Firefly to position yourself at an optimal angle for blinking onto the target you want to snag, while staying out of the enemy’s field of view. Abuse the treelines as much as possible, and hide yourself before you’re ready to strike. Once you are ready, blink in and quickly cast Flaming Lasso on the target, then turn around towards your team and use Force Staff to push yourself towards them. When you reach your teammates, begin applying Sticky Napalm stacks onto the target, and any heroes that try to come to their rescue. Use Flamebreak to knock key heroes back; the closer they are to where the projectile lands, the further they get pushed away. All this should buy your friends enough time to position themselves as well and begin casting their own spells. As a hero that is heavily dependent on Blink Dagger, Batrider’s worst nightmare is… well, not being able to use the thing in the first place. Heroes with global presence such as Zeus, Nature’s Prophet, and Spectre can easily disable Blink Dagger before Batrider is able to use it, thanks to their abilities causing damage from anywhere on the map. Of course, this does require some prediction, as Batrider does have the ability to hide himself in the trees before going in. It’s important to note that Flaming Lasso is still just a regular disable—which means that it can be removed with a strong dispel. Heroes like Abaddon with his Aphotic Shield, Oracle with his False Promise, Legion Commander with Press the Attack, and more can easily dispel the lasso, rendering Batrider’s initiation moot. The same goes for heroes that can displace Batrider over a long distance, such as Vengeful Spirit with her Nether Swap and even Weaver with an Aghanim’s Scepter upgraded Time Lapse. This is because Flaming Lasso is designed to break if the target and Batrider are separated by at least 425 units. Linken’s Sphere should always be considered when playing against Batrider, for obvious reasons. In fact, if Batrider initiates on a hero with Linken’s Sphere without checking their inventory first, he will essentially be caught with his pants down. Use this opportunity to remove Batrider from the game as soon as possible.